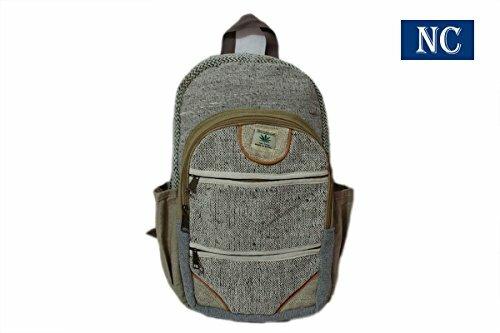 This unisex, high quality, hemp backpack features multi color panels trimmed in Natural color Hemp Fabric. It is an ethical, sustainable, eco-friendly alternative to synthetic and leather backpacks, featuring 100% wild hemp exterior lined with heavy duty cotton. This combination creates a sturdy, extra durable backpack built to last with rugged use. It offers multiple compartments for storage and easy organizing and a main compartment roomy enough for a laptop. Fits up to 14 inch laptop. This one of a kind backpack, handmade in the mountains of Nepal, is perfect for back to school, hiking, or travel. Other great styles and colors are also available. Size : 16" x 12" x 5"
Made Of : 100% Natural Hemp. Made In : Nepal Hemp House Outlet Kathmandu. Handmade, Eco-Friendly and Fairtrade. Unique and One of a Kind Backpack. Perfect for school. 16" Height by 12" wide by 5" depth. Two mesh pockets on sides to hold water bottle. If you have any questions about this product by Nepal Hemp House, contact us by completing and submitting the form below. If you are looking for a specif part number, please include it with your message.